More and more, our T-shirt designs start where they should: in pen and ink on paper before becoming digital. Too often, artists (we're as guilty as anyone) just start by banging around in Photoshop or Illustrator, moving pixels and Bezier curves, overwhelmed by too many fonts, and too sanitized a work environment and lose sight of the soul of the project. So I've really been trying to conceptualize projects on paper. With a pen. The old-fashioned way. And then, the digital tools become invaluable for tweaking and bringing a project full-circle. A good example is this print for Carelli's Pizzeria. It's one of our favorite places to grab a pint or a slice when we're working late. It's just down the block, so it's handy and tasty. 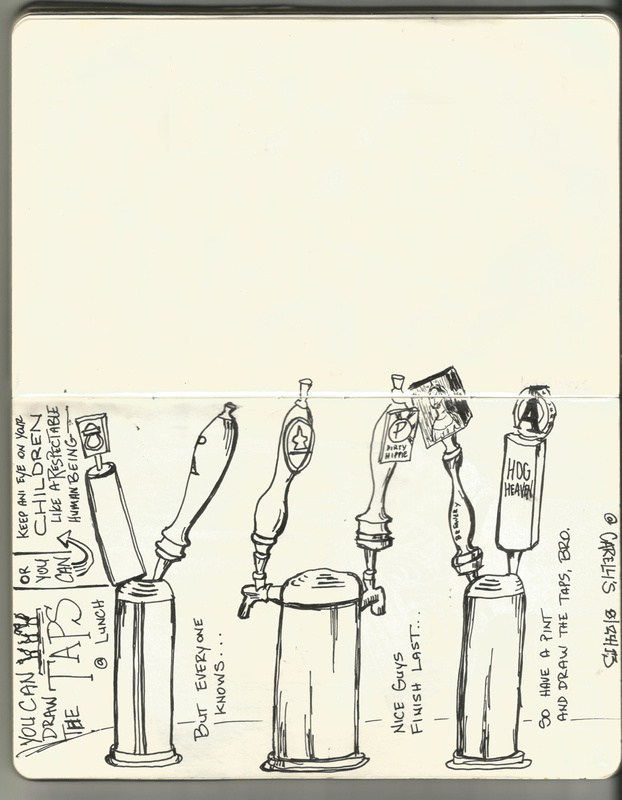 One day I was hanging with my munchkins and I grabbed my sketchbook and drew the taps at the counter. A few weeks later, one of the owners said she had seen my sketch asked if we could put the taps drawing on their next round of T-shirts. Perfecto! I scanned my sketch, tweaked it a bit in Photoshop, added a banner with their favorite phrase and voilà, a new print from sketchbook to T-shirt... our favorite way to do it. A page from my sketchbook one day last summer. Someone at Carelli's saw it and said we should put it on their next round of T-shirts. The new taps print on a super soft black T-shirt for Carelli's Pizzeria in Craig, CO.